Calculated to fit based on measurements and calculations. Your instep is the top of your foot. It extends from your ankle, down to where your toe joints begin. 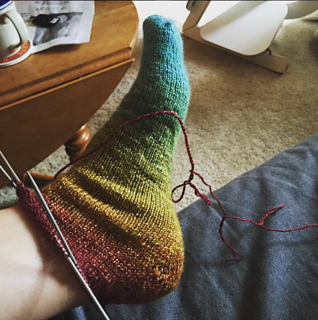 For some, a traditional short row heel fits fine. But if you have a high instep, there just isn’t enough fabric to fit your heel. 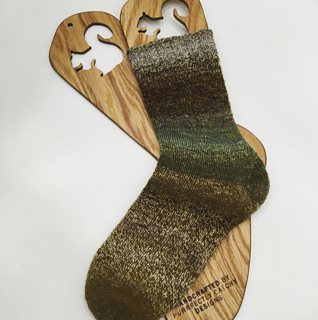 It can make your handknit socks hard to pull on over your heel, and make the socks stretch tight across where the instep joins the ankle. 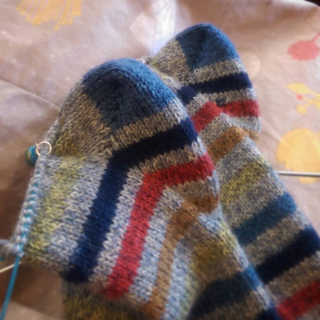 This heel will fit a high instep, but also has the benefit of making a much less drastic transition between the cuff and foot in a self-striping or slow-changing yarn. I’ve called it a Pocket Heel because I think it looks like a pocket turned inside out flapping in the breeze. Measure your Foot Circumference just above the ball of your foot. Measure your Full Instep Circumference. To do this, point your toes and measure around the widest part (it will be across your heel and around your ankle where it joins the instep. These instructions can use any short row method you choose, but my preference is Shadow Wrap Short Rows. You can buy this and the High Instep Short Row Heel together in the Heels for High Insteps for a discount.